King Buck Safaris brings 35 years of guiding experience to the avid hunter in various types of Big Game Trophy Hunts throughout western Canada. I purchased my Saskatchewan whitetail area in 1992. We have been in operation as a full-fledged big game outfitter for the past 16 years in Saskatchewan. King Buck Safaris has consistently produced B/C whitetails and black bears (including color phase) in both Saskatchewan and Manitoba. The Saskatchewan Lodge is located 5 miles south of Hudson Bay, Saskatchewan. The lodge can accommodate up to 14 people at one time. Deer hunters are booked at eight per week. ( maximum ). All meals are home-cooked at our Saskatchewan lodge. Whitetail hunters have access to a 52" screen T.V. for entertainment after the days deer hunt is over. There is a bathroom and shower downstairs for hunters' convenience. We have deer hunting access to approximately 92,000 acres of provincial forest and 10,000 acres of farmland area in and around Hudson Bay, Saskatchewan. Trails are cleared to every tri-pod deer stand. Whitetail hunters are dropped off at the base of their stand and the site is baited with grain at the same time. Whitetail hunters are taken in the morning to their deer stand using a 4x4 Geo Tracker vehicle and then picked up in the evening. Our area in Saskatchewan holds a very high density of deer. One can expect to see anywhere from 10-30 deer in one day depending on which deer stand is utilized for the deer hunt. There are also bait sites with fewer deer numbers - these stands tend to produce big whitetail bucks. The deer stands are home-built 16 ft. tri-pod (patent pending) with a 360 degree swivel seat and a shooting ring. The deer stands have 'camo' enclosures with shooting windows for an unobsructed view of the hunting site. This blind protects the deer hunter from the elements. There is also a rug that goes on the platform floor. There are no heaters but if the deer hunter wishes to bring their own they are welcome to do so. I personally don't like the hissing noise that some heaters give off while in operation. I ussually recommend a pair of boot blankets, hand warmers and foot warmers or an enclosed body bag. Deer hunters must keep in mind that record-book whitetails did not get big from being stupid, so we have to have all the odds in our favour. Deer hunters must not concentrate on just the bait pile but also keep scanning the surrounding area. The majority of my client's trophy whitetails were shot off to the side of the deer baits ( 60-70 yards ) in heavy cover. Trophy Whitetail Bucks tend to stand still while the does and smaller deer are feeding. 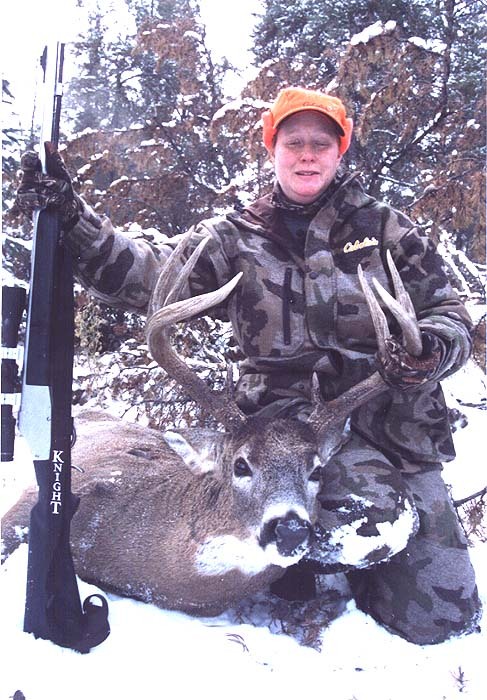 The average score of a Saskatchewan Whitetail is a 130-140 class deer. HUNTERS BEWARE if any outfitters tell you the average deer antler score is 150 B/C. This average score would only be possible in a game hunting deer preserve. 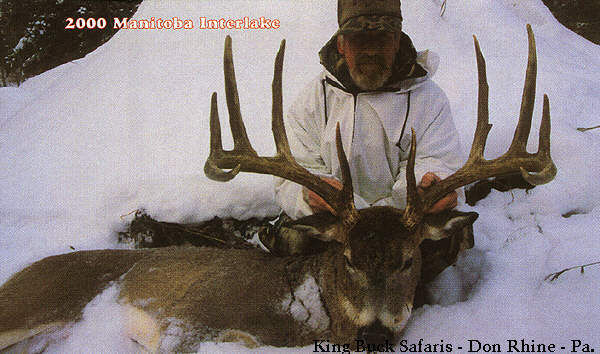 King Buck Safaris has claimed title to the World's First Typical 8 x 8 Whitetail Deer ever taken in the wild. This majestic whitetail was taken in Hudson Bay, Saskatchewan by Joe Lurch from New Jersey in 2004. Joe's Phone number is: (work) 732-681-0206 - ( home) 732-681-8754. We also have video of a typical 7x7 whitetail deer with 12" G2's, G3's, G4's and G5's. All four tines are straight across the top. This whitetail was missed by Charles Nicosia of New York. This magnificent whitetail still lives in Saskatchewan's pristine forest as he was spotted with only half a rack by one of our clients. We named this whitetail deer "Nicosia's Ghost". The video can be seen by all whitetail hunters during their hunt at our Saskatchewan lodge. (1) "I have never seen a whitetail deer in any magazine,T.V. show or deer hunting video with such amazing G2,G3,G4 and G5 tine length. These tines must be nothing less than a foot long and they are straight across the top of each other." 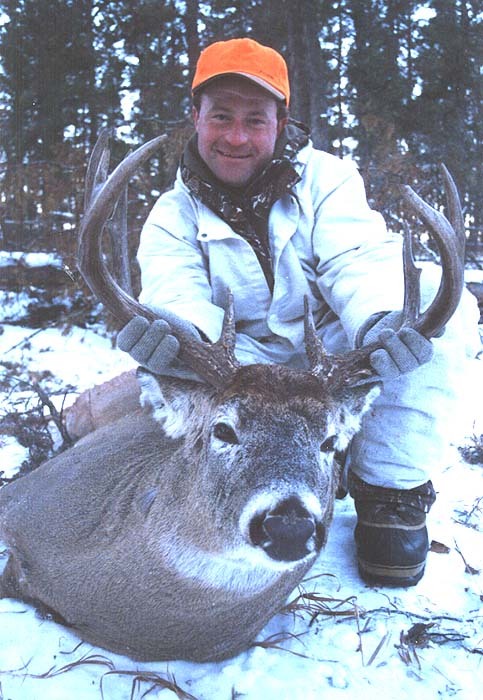 (2) "The whitetail has incredible tine length and both sides are so symmetrical. The deer antlers must be a foot and a half above his head. It is hard to believe this whitetail deer is a typical 7x7 with no deductions". (3) "This whitetail deer must be a New World Record". MY REPONSE: No one knows until the deer is actually killed and truly scored by B/C officials. But I will say this - "that this particular whitetail deer that you have seen on video in our Saskatchewan Lodge was an awesome contender for the next World Record. 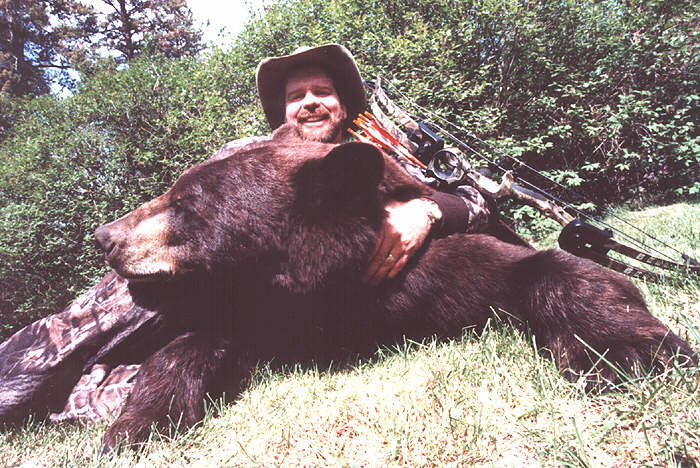 It truly hurts to have given one of your clients an opportunity on this magnificent giant and not have the deer hunter capitalize on the shot. The bullet from Charlie Nicosia's weapon still haunts him to this day." (4) "How did your whitetail hunter miss that deer?" "EXCITEMENT RULES!" If you don't get an adrenalin rush from an opportunity on this calibre of a whitetail then you might as well hang up your weapon. The footage that you have seen is every "Whitetail Hunters dream." Now after reading about these two outstanding whitetail deer, one must realize that with these type of whitetail gene in this incredible area, sooner or later a new "WORLD RECORD WHITETAIL DEER" is likely to surface. One must also realize that if he or she dreams of shooting a whitetail deer of this calibre you have to hunt an area that holds them and King Buck Safaris has just that - with solid proof - in Saskatchewan. - I personally do all deer stand setting up, not like most other deer outfitters who depend on guides with a majority of them having no knowledge of whitetail deer habits. - We place hunters on deer stands which I feel hold 150 or better whitetail bucks (number estimated from deer sign left in the hunting area). - We start our deer baiting from the last week of September (4 to 5 weeks before deer hunts start) and into the latter part of December ( 2 to 3 weeks after deer hunting season). - The deer stands are my own design ( patent pending ) - one of the most sturdy (safe) tripods on the market today. These deer stands are 16ft when seated, with a 51" rugged platform, double guard rail and removable shooting ring. You enter into a 'camo' enclosure with zippered shooting windows designed to keep the deer hunter out of the weather. Every one of our hunting guests wanted to purchase one after the deer hunt was over. All this comes with 35 years of whitetail deer guiding experience and successful trophies harvested, especially, Joe Lurch's MAGNIFICENT 8X8, which is the first typical 8X8 whitetail frame ever shot in the wild. It is the hunter's responsibility to have payment in on time! Hunters will fly into Saskatoon Airport, rent a vehicle and drive 3 1/2 hrs east to Hudson Bay, Saskatchewan. Accommodations before and after the deer hunt are the responsibility of the hunter. - shampoo / soap etc. Being Alberta born and operating in both Manitoba and Saskatchewan for the past 16 years gives me the opportunity to definitely promote the fact that Manitoba is a 'SLEEPIER' province for trophy whitetail in western Canada. Manitoba has been overlooked as a prime deer hunting destination for years and is only now starting to gain recognition for its abundance of trophy whitetails. The Manitoba deer camp is located on the Manitoba/ Saskatchewan border north of the Porcupine Mountains in North Western Manitoba. This tent camp is one that involves fair chase of trophy whitetails unlike my Saskatchewan camp which allows baiting for deer. This means that every whitetail buck shot in this Manitoba camp will make the record books if the deer antler score is high enough. As a bonus, Deer hunters are allowed to take a timber wolf on their Manitoba Outcamp hunt at no extra charge. 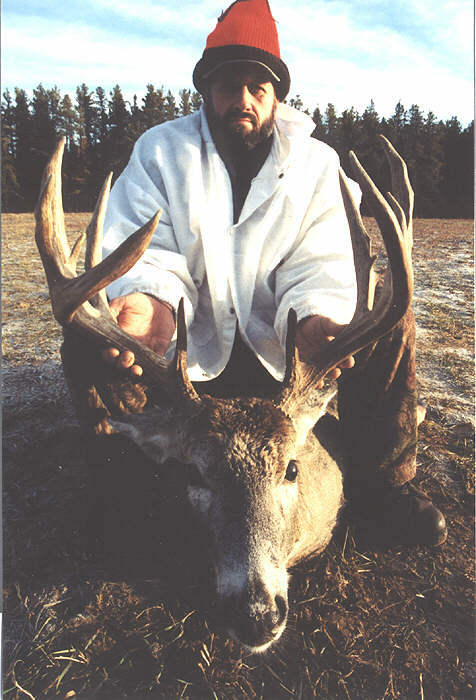 This Manitoba outcamp has consistently produced trophy B/C whitetails since it was opened in 1994. The 2 most distingiushing features which separate this deer camp from any other whitetail camp or area within Manitoba is the fact that this whitetail hunting area has NATURAL MINERAL LICKS. These mineral licks are anywhere from 1/4 to 1/2 an acre in size. We have four such licks in the 30sq. mile area where our hunts are conducted. These licks and the high protein pea vetch plant both attribute to the whitetail deer antler growth in this area. Now Remember these licks are truly natural CANADIAN MINERAL LICKS not marketed deer products, like 'Antler King' and similar products. The second outstanding feature , which gives this Manitoba deer camp a high rating, is the fact that the buck-to-doe ratio is very high. Hunter ratios for this area are 3 whitetail bucks to 1 doe. Jerry Seager of Michigan claims he had 5 whitetail bucks chasing one doe during his 6 day deer hunt. 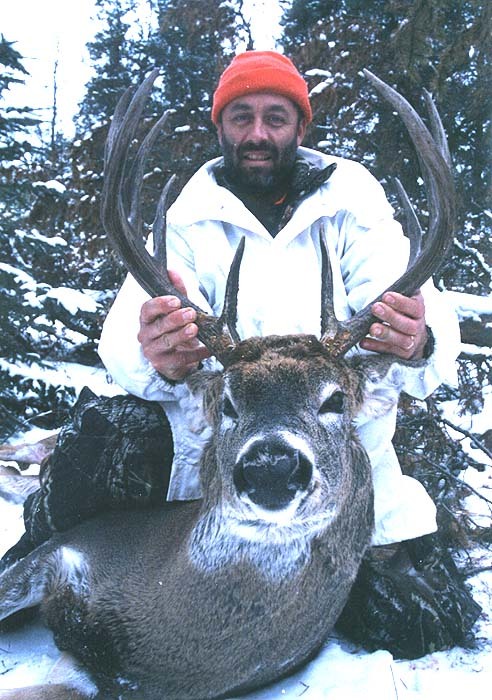 Ron Rhine, of West Virginia, Phone number# 304-249-5822 is the pioneer of this outcamp and describes this Manitoba deer camp as a "HUNTER's PARADISE WITH UNLIMITED POTENTIAL"
Ron has witnessed many record book whitetail bucks taken in this area by my clients; bucks with 9 1/2" circumferences, 29" beams and 28" inside spreads. Ron has taken 150 and 160 class deer but missed 2 tremendous record book deer. 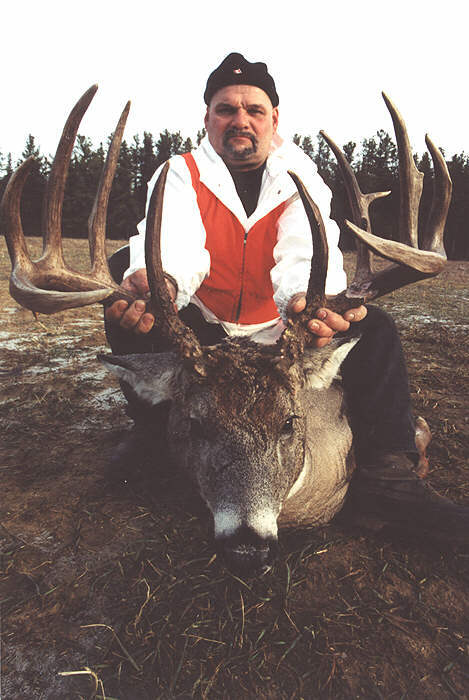 The one whitetail buck which stands out above all is Steve Esposito's giant, which gross scored 199 B/C. This whitetail had incredible main beams, brow tines, G2's, G3's, spread and mass." An incredible 5x5." 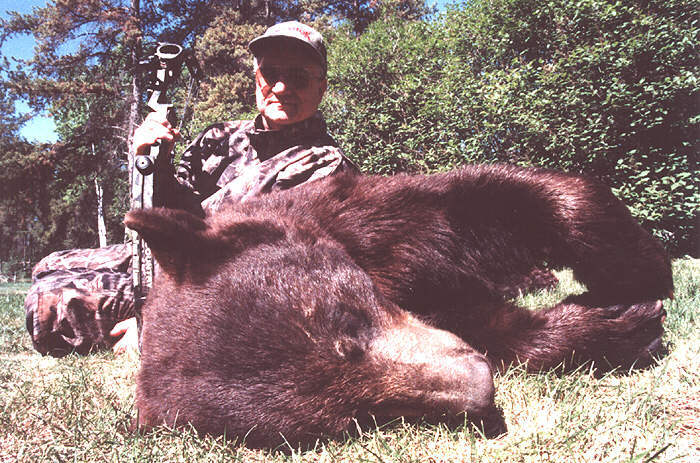 In 2005 Steve Esposito fired three rounds at a whitetail which he claims was beyond anyone's wildest dreams. Steve states this deer's main beams were like baseball bats and his 199 would have fit inside without a doubt. Steve Esposito of Pennsylvania can be reached at : 570-879-9063. Our deer stand placement in the Manitoba outcamp varies from one area to the next. Some deer stands overlook meadows where doe's come to feed, others are in bottlenecks, transition areas, intersecting travel corridors and beaver dams across slough bottoms and waterways. The treestands for this Manitoba Deer Hunt are erected only by myself so if any hunters are unhappy with deer stand placement don't blame the guides - but most hunters are happy with placement. (1) - you're planning on being moved from tree stand to treestand on a day-to-day basis. This is definitely not allowed in my deer hunting operation. (2) - you think you know more about hunting trophy whitetails than me, my advice to you is save your money and stay home. The deer act differently in the Manitoba Outcamp area than where you are from. - This camp is only for the true trophy deer hunter who is willing to go home empty handed if he does not have a opportunity on a 150B/C or better whitetail deer. - Testimonials from the above mentioned Manitoba Deer Clients give the serious deerhunter some insight as to what quality deer live in the forested areas of Manitoba "HUNTERS PARIDISE WITH UNLIMITED POTENTIAL"
- Deerstand placement in bottlenecks, transition areas and intersecting travel corridors. - We place hunters on treestands which I feel holds 150 or better whitetail bucks from deer signs left in the hunting area. - Genes in deer hunting area from outstanding whitetail bucks killed by clients. - Last but not least, we are honest and reputable. 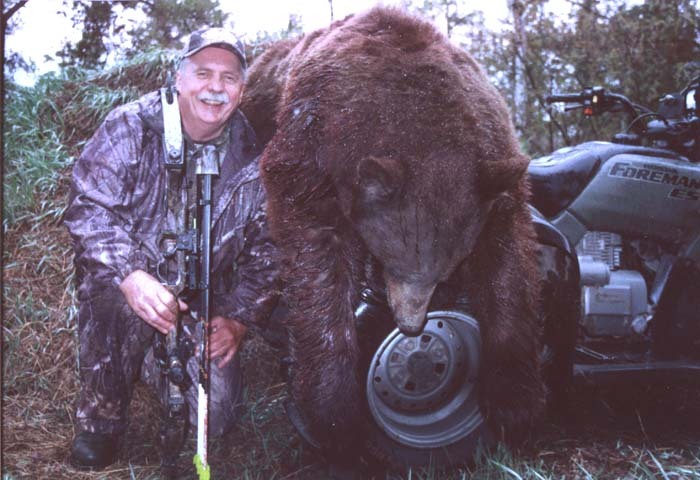 This all comes with 35 years of Whitetail deer guiding experience and successful trophy deer harvesting especially Steve Esposito's 5x5, which scored 199B/C. Balance is due by AUGUST 1st in the form of a CASHIER's CHEQUE ONLY! It is the hunters responsibility to have payment on time! Hunters will fly into Saskatoon Airport, rent a vehicle and drive 3 1/2 hours east to Hudson Bay, Saskatchewan. Hunter's must arrive at Saskatchewan lodge on Saturday night in order to leave early Sunday morning for the Manitoba Outcamp.